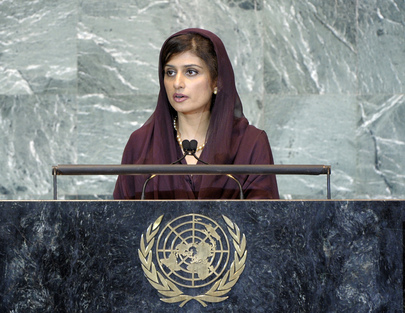 HINA RABBANI KHAR, Minister for Foreign Affairs of Pakistan, speaking on behalf of Prime Minister Syed Yusuf Raza Gilani, said Pakistan was here today because it believed in multilateralism. “We can do more together than we can apart,” she said. Pakistan also believed in the promise of the United Nations: a world free from war, governed by the rules and norms of civility and inter-State conduct based on respect for the Organization’s immutable principles. Thanking the international community for its support in the wake of devastating floods last year, she said that Pakistanis would overcome that misfortune with fortitude and resilience. Noting that Pakistan was seeking election to the Security Council, she said the Government had reached out to its neighbours. “We realize the enormous opportunities that ensue from pursuing with diligence the vision of common development and cooperation,” she said, noting that Pakistan and India were now engaged in a dialogue process, which her Government planned to make a “mutually rewarding enterprise”. Pakistan looked forward to resolving all outstanding issues, including the Jammu and Kashmir dispute, and working with India to create mutual confidence in avoiding an arms race and enhancing strategic stability. In Afghanistan, Pakistan strongly condemned recent terror attacks in Kabul, and fully supported an Afghan-led, Afghan-owned, inclusive reconciliation process, she said. Urging an end to violence, she said the road ahead for peace – in Afghanistan and the region – was full of challenges, and in that context, her Government attached importance to the Trilateral Core Group and the Afghanistan-Pakistan Joint Commission for Peace and Reconciliation. Given the volatility of the situation, States must work closely as responsible partners and not question each other’s intentions. Reaffirming support for Palestinians’ inalienable right to an independent homeland with Al Quds Al Sharif as its capital, and to United Nations membership, more broadly, she said that the aspirations of people in North Africa and the Middle East must be accommodated without external interference, in a manner consistent with the principle of sovereignty and territorial integrity. Recounting how Pakistan had been “ravaged by the monster of terrorism”, she said the country was united in its determination to eliminate that scourge from its soil, region and the world. “It is Pakistan’s firm determination not to allow any space on its territory for militants and terrorists,” she stressed, adding that the issue of organizing, financing, arming and abetting terrorist violence must be seriously addressed. Pakistan had done all it could to realize a bright future for Pakistanis and Afghanis, especially by advocating for closer regional economic integration. Prioritizing development in terms of mutually beneficial joint ventures in infrastructure, energy and trade would help change the picture. As for the United Nations, Security Council reforms must be taken in a manner that would reinforce confidence in that body, she said. The Organization provided the best global forum to enhance understanding, but she voiced concern at campaigns that stigmatized Islam and Muslims. In sum, she said that as a democratic country, Pakistan would do its best for the cause of global peace and prosperity. “We will defeat those that seek to terrorize us. We will empower women. There will be challenges, but Insha’Allah, we will overcome them,” she said.